How 'bout some electric pink lemonade for your Tuesday? Actually, the strawberries blended into the exact shade of orangy-coral lipstick that my sister was on the hunt for when she came to SF in June (Claire, drink enough of this for fruit punch mouth and I got you covered). But we're all blind from the eclipse anyway, right? Pink or coral, colors don't matter to us now. What really matters is flavor, and this lemonade has got it! Tart lemon, sweet strawberry, and SURPRISE! Some lovely, floral, pink peppercorns get steeped in the simple syrup. The end result is less of a peppery explosion and more of a gentle tingle in the back of your throat reminding you this lemonade has got a little extra going on. And it's vibrant hue is only a bonus! Even better, the color comes straight from the berries and you can leave the Red #40 out of this. Pink lemonade always reminds me of The Sound of Music, because of the scene where Max and the Baroness are discussing her future with Captain von Trapp and wondering what makes their drinks pink. The only way I've ever had pink lemonade in real life was the powdered diet version my Mom used to buy. I drank a fair amount of that in high school, and now I shudder at the unknown ingredients I was chugging. It may not be the trendy millennial pink of the powder, but these days, I prefer the real stuff, made from real fruit and more vibrantly (and naturally!) colored than what I used to mix up. The good news is this lemonade takes next to no effort to put together. 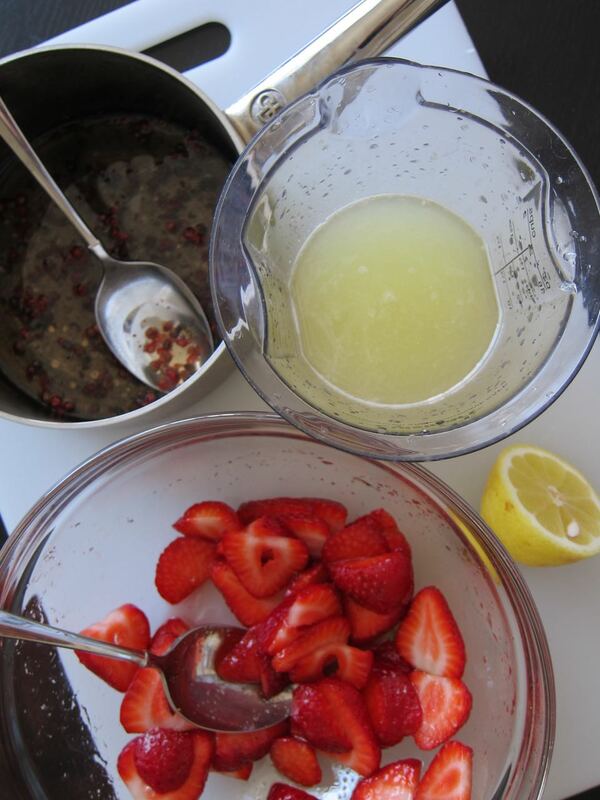 Just find the ripest strawberries and juiciest lemons around, grab your best citrus squeezer or juicer, and get going. The peppercorns may be hard to find in some large grocery chains, but I was able to find them at my Whole Foods and they are definitely sold online. In a pinch, you could sub black pepper, though that has a slightly different, stronger pepper note, or you could leave it out if you're just feeling the strawberries and lemon. Regardless, make up a batch, invite over some friends, and marvel like Max and the Baroness at the wonder in your glass. With the back of a spoon or in a mortar and pestle, coarsely crack the peppercorns. In a small pot, bring 1/4 cup water to a boil, add 1/8 cup sugar and stir together over medium-high heat to dissolve. Add the pink peppercorns, remove from heat, and let stand for 20 minutes. Strain, and let cool. Add the remaining 1 tbs sugar to the strawberries in a medium bowl, and let sit for at least 10 minutes, until they begin to release their juice. Transfer mixture to a blender and puree completely. Strain out any seeds, if desired, though I didn't have very many to strain after tossing the mix in a high-speed blender. In a large carafe or pitcher, combine together the strawberry puree, lemon juice, pink peppercorn syrup, and the 3 cups of filtered water. Shake or stir to combine, and serve immediately over ice, or chill until ready to serve.